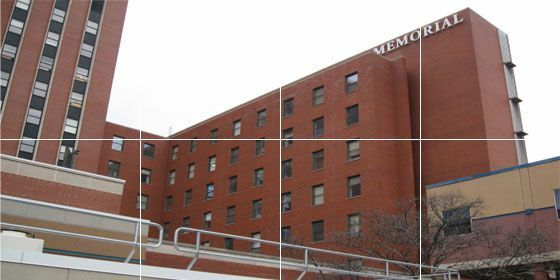 Mechanical and electrical engineering for the $5.7 million renovation of a 526-bed patient tower built in 1958, including upgrade or replacement of complete MEP infrastructure, and floor by floor renovations for new patient rooms. New MEP infrastructure was put in place to support renovation of six patient floors, with five additional floors to be renovated at a future date on a floor-by-floor basis. New 9th-floor mechanical penthouse addition houses new HVAC equipment to serve patient floors 3 through 6, and new air duct shafts have been cut through the existing structure to serve the floors below. G/BA created an interior scheme for duct shaft extensions down through the patient tower to facilitate future expansion with minimal impact, to minimize re-work or interruption of newly completed patient space. Complete new electrical service serves the patient tower through new electrical switchgear and main transformers located in new basement electrical rooms (built within a former laundry area). A complete new emergency power distribution system originates from new automatic transfer switches in the basement fed from an existing emergency generator, intended to provide updated, separated, emergency power branches throughout the bed tower. New electrical conduit risers were created from the new basement main electrical rooms up through the 8th floor and were terminated on each floor 3 through 8, for future extension to each patient floor. New toilet exhaust and isolation exhaust systems were set up with variable speed drives and controls to facilitate future floor renovations/additions with minimal rebalancing of air to already completed and occupied patient floors. The pure water steam humidification system and hot water heating system are fueled from the existing high-pressure steam plant. A new medical gas system distribution and new central medical vacuum pump were provided. A new wet pipe fire protection sprinkler system was extended throughout the renovated floors, as well as the new and existing mechanical penthouse. An interim scheme was devised to retire five old air handling units through temporary air service connection and controls from the new central penthouse air handling equipment, providing interim HVAC until future floor renovations could be completed.